David Hockney was part of the wild art scene of the 1960s. But unlike the contemporary Pop Artists, he has continued to develop new forms of expression until today. A documentary film shows his work and its background. Our reviewer Phil Butland has watched it. The German theatrical release of Randall Wright’s documentary “Hockney” coincides with the exhibition “From Hockney to Holbein” at Berlin’s Martin-Gropius-Bau. This has focussed attention on the sadly underrated artist from Northern England. The film comprises mainly of interviews. Some are boring, others provide interesting critical analysis. But nothing is more revealing than the quiet moments where Hockney himself explains his theories of art and the world. Like his idol Picasso, Hockney did not restrict himself to a single art form. As well as his paintings, he produced countless sketches, opera scenery and photo collages. He was quick to deploy various new technologies, such as fax machines or mobile phones. Hockney rejected popular fashion: when critics insisted that art must represent something, he started to introduce random coloured lines to his drawings. These lines were to represent themselves and nothing else. The interviews in the film come from different periods, which help to show how Hockney’s methods changed over time. But one thing remained constant: his attempt to create art that does more to reproduce a single moment of reality. He battled with the limitations of photography, which he believed to be too transient an art form. This led him to produce collages. He saw in the mixture of photographs in a collage, “the time and the illusion of space” that individual photographs are unable to depict. In possibly Hockney’s most famous painting, “A Bigger Splash” we begin to approach the effect that he was trying to produce. “A Bigger Splash” shows the moment when a swimmer jumps into a pool. The colour and composition of the picture are able to show more than just the single moment, unlike most photography, which – both literally and metaphorically – lacks the necessary perspective. The film acts as something of an obituary to Hockney, now nearly 80 years old. In it, he celebrates his life as a gay man in the 1960s, when homosexuality was illegal. He survived because, as he says in the film, “I lived in Bohemia. And Bohemia is a tolerant place”. At the same time the film mourns the death of Bohemia – many of whose members fell victim to the AIDS epidemic in the 1980s. In recent interviews, we see Hockney as very much alive, although we ask ourselves if his time in the spotlight has passed. At a time when the art market is dominated by vacuous Young British Artists like Damien Hirst, it is refreshing to hear an artist who seriously considers his work – especially one who does this from a class perspective. So, in the film, we hear Hockney start an anecdote: “In 1962 I was at a demonstration in Trafalgar Square and decided to go to the National Gallery to look at me the frescoes …” Elsewhere he celebrates with his working-class family and shows himself to be just as comfortable in their presence as amongst the artists and dancers of Bohemia. As tuition fees in the UK rise, we can legitimately ask how long Bohemia will remain accessible to working class kids like David Hockney. All the more reason, to pay tribute to his life and work now. 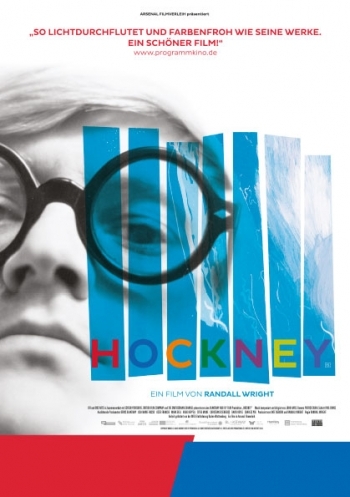 The film: Hockney, directed by Randall Wright, UK 2014, 113 minutes Arsenal Filmverleih. In German cinemas from October 15. The exhibition: from Hockney to Holbein: The Würth Collection in Berlin, Martin-Gropius-Bau, Berlin, until January 10, 2016.